November marked the opening of the Norwegian Honorary Consulate General right in the centre of Geneva on Rue Amie-Levrier 15. 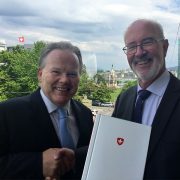 The new Honorary Council, Rolf Olsen, says he’s thankful to the Norwegian Embassy in Bern for all their support, and we look forward to collaborating both with Norgesklubben and the Norwegian delegation in Geneva. He would also also celebrate Olivier Dunant who has held the post of the second Norwegian Honorary Consul General for more than thirty years. And of course, he is proud to be the third… “I will do my best”.